An historic house on Walkley Crescent Rd will soon be demolished to make way for a set of new homes. The house, number 40, has all the looks of a Freehold Land Society house. 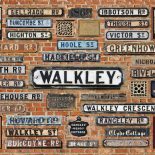 Walkley Crescent Rd was part of the Rivelin View Land Society. It bears a name plaque which gives the house the name ‘Armthorpe Cottage’ and the date of 1868. This entry was posted on July 21, 2017 by Bill Bevan in Freehold Land Societies.